Background services are one of my favorite features on Android. As the idea of a smartphone changes from a phone to a true contextual device, background services that keep track of user context and push information to the user at appropriate times are essential. That said, the current visual treatment they get on the device to let a user know that they are running, which hasn’t changed much since the inception of Android, needs to change. Here is a screenshot of my notification shade right now. Note that only one of the 8 notifications I am currently seeing is actually a new event that I actually need to respond to. The flooding of my notification window with the always running service notifications numbs me to actually important actionable notification that sits there. 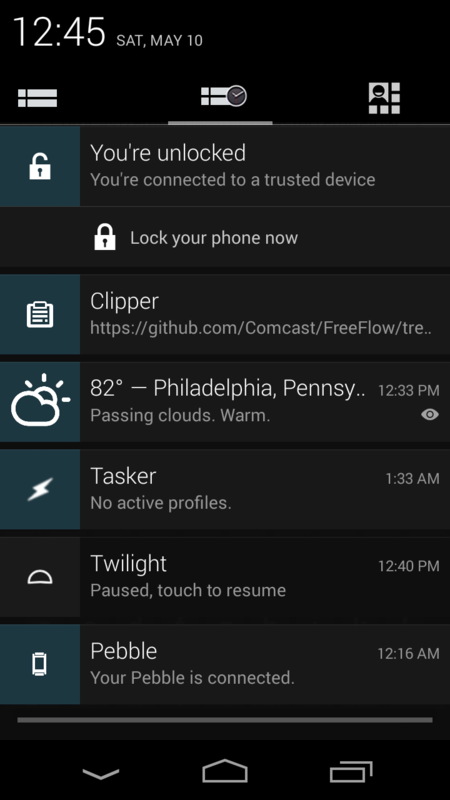 A lot of ROMs already implement Notification Tabs. Moving the background services to a separate tab so that I don’t have to look at them whenever I pull down the shade would solve the problem, though it does add some complexity to the shade. In both the cases above developers will have to explicitly change their own notification priority to escape the “grouping”. So if a significant event occurs, their notification can be shown along with the rest of the notifications. As notifications become increasingly more important to the mobile experience, like the coming smart watches that are all about contextual notifications sent by your phone, there is a greater need to make sure that we don’t overwhelm the user with an unorganized stream of information. I like your first proposal more. One change I would suggest is to include the count in the icon for the tab (replacing the clock with the count of ongoing notifications). That could be interesting. Though there is research that shows that putting numbers on any UI element makes people try to optimize it (apparently subconsciously we see all numbers as a score). But it does inform you about the number of services running immediately. Looking at the rumor published by Android Police “Google Exploring Home Screen Overhaul With Revamped Notification Shade, Recents Menu, And More”, it seems to me that Google wants to make notification shade implemented by the currently active launcher. Android Police police people said the mockups are based on what they saw not just made up. This will have two consequences: launchers will be able to improve the experience but on the other hand nothing will be guaranteed for the users. 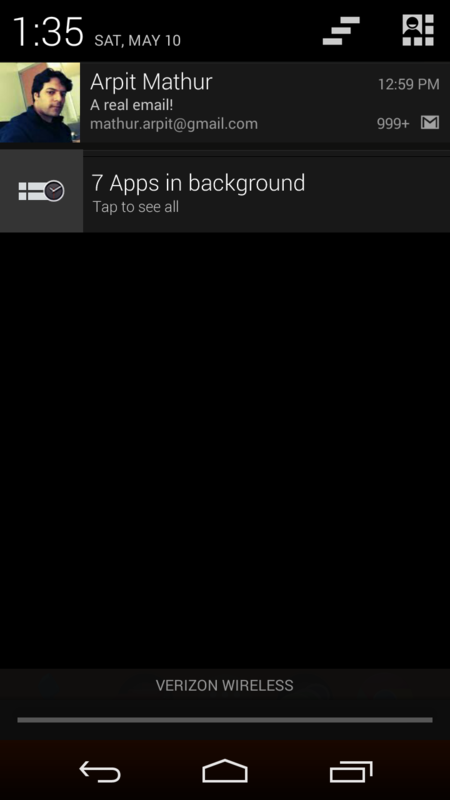 The main reason (there are others, not talking about those) why background notifications even exist is that Android tends to close background apps without these notifications. There should be another way! I have an app called Light Flow (just an example, way more apps have this) which manages my notification LED. I really don’t have to see a notification telling me this app is managing my LED. I already knew that and the notification clutters my notification screen. Android should provide a way for apps to stay active without such a notification. I would only need to see an overview of this apps somewhere in the settings. 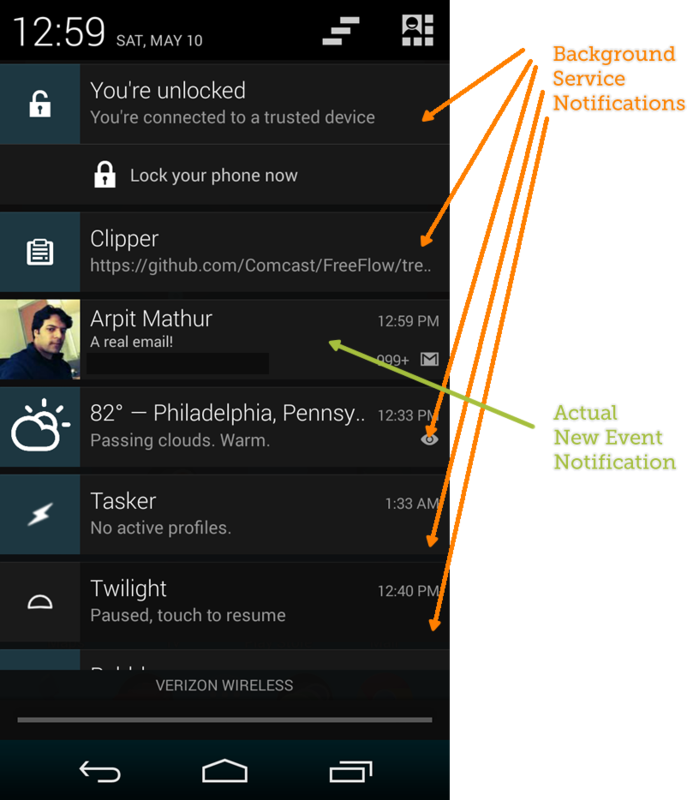 This kind of feature would IMHO remove a lot of the clutter in my notification screen. I don’t necessarily need a way to prioritize them. They just shouldn’t exist. In fact it doesn’t even fall under the definition of a ‘notification’. Its a safety feature to require an ongoing note if the application is working in the backgroung. Sadly, I dont see google following that.